Today is one of those wonderful days: whisked from Heathrow to Munich and on to the Austrian alps. It's even sunny here in the ski resort of Kitzbühel where the European press has assembled for the launch of the Lexus GS. By chance I'd already had a drive this car - a few months back I was in Sydney and a friend had one of the first new-shape GS 350s. But as fuel is so much pricier than it is down under, Lexus GB has instead chosen to import the GS 250, as well as the GS 450h (there's no diesel). 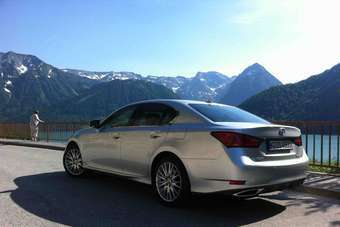 Certain other European markets will, however, take the GS 350 with all-wheel drive. Given how modest sales of the old-shape car were, I'm almost surprised that Lexus Europe is having another go at tackling the 5 Series sedan segment. They say this region should see 6,000 sales of the new car in 2013 (including Russia, Lexus' biggest market after the US, China and Japan). Lexus GB's managing director Jon Williams reckons his dealers will sell a modest 1,150 units of the new model in the remainder of 2012, and 1,475 in 2013. As for 2014, the total is expected to reach 2,250 thanks to the addition of a new derivative to be powered by a small-displacement hybrid powertrain. I'll have more on this very soon, but you can read initial details about that here.